Sally Genser had her eye on this distinctive bluestone mansion house in Melbourne’s Cremorne for many years. 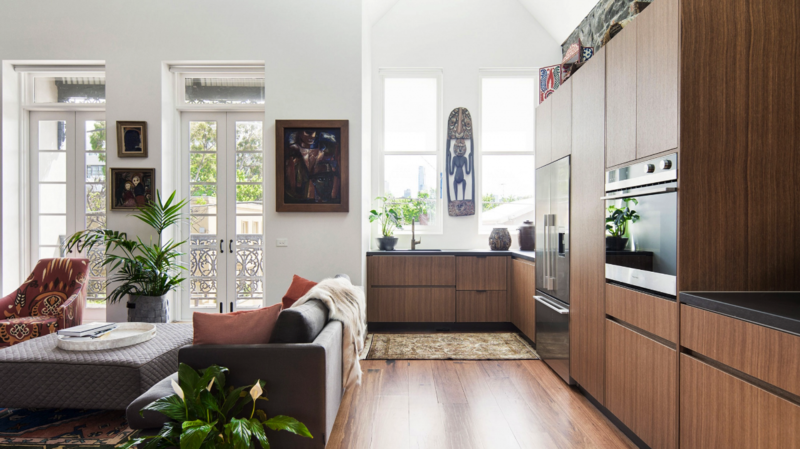 Having grown up and raised her four children in this inner-city pocket, she was always drawn to this house, with its impressive scale and grand street presence. When it came up for sale in 2012, she jumped at the opportunity to buy it. Built in 1881, the house is the only example of Dutch/Flemish Architecture in the Cremorne area, which makes it quite unique. Sally knew the 136-year-old building would need a lot of TLC to return it to its former glory – due to its heritage value, she was required to keep the original façade of the house, including slate roof, and she also chose to retain the decorative cast iron lacework friezes, and the balcony lacework balustrades. Contemporary additions include the steel windows, doors and bi-fold door frames, all custom made locally – no stock standard fittings here! Sally is the passionate founder and owner of two boutique building and property businesses, 381 Cremorne and Phillip Island Apartments, and her many years working in the building industry proved invaluable, as she navigated the complexities of renovating a heritage building. ‘I am fortunate that I have worked in the building industry from the age of 18, so have picked up tips and tricks along the way’ she says. ‘I am also privileged that my four adult children also work in the property, building and architecture industry so I had innovative and clever minds to bounce ideas off!’. The design and renovation process was by no means straightforward. The renovation was held up for 2 years due to council permits (grrr), but the building works were finally complete in 2016. Working closely with her daughter Hannah, who is an architect, Sally spent a long time designing, refining her selections, and managing the project.